Effective Volumetric Visualization. I am working on perceptually meaningful volumetric visualization techniques and exploring how they can be used for information visualization, medical visualization, and scientific visualization. Procedural Techniques for Computer Graphics. I have done much work on procedural texturing techniques, procedural modeling, and procedural animation. Volumetric Displays. We have a project to develop software to drive a 3D glass cube volumetric display system. We are also evaluating the usefulness of this technoloqy for a variety of applications. Ebert, D., "Visualization and Software Architectures for Volumetric Displays," National Science Foundataion (~$306,000), September 1999 - August 2002. Ebert, D. ""Procedural Rendering Research Using Alias/Wavefront Maya," Alias/Wavefront ($284,900 in software). August 1998 - May 2000. Nicholas, C., Ebert, D., Miller, E. "Architectures for Data Driven Information Processing," Department of Defense ($2,998,378). June 1997 - April 2002. Ebert, D. "Volumetric Display of Earth and Space Science Data," NASA GSFC, $44,000. January 1998 - December 1998. Ebert, D. "Volumetric Display of Earth and Space Science Data," NASA GSFC, $7667. June 1997-September 1997. Ebert, D. "Interactive Stereo Volume Visualization for Space Physics Data," NASA ($69,571). January 1995 - May 1997. Ebert, D. "Enhanced Accurate Medical Volume Rendering," JHU University Medical Center ($4,058). July 1996 - August 1996. Ebert, D. "BFRL HTML Conversion and Automation," National Institute of Standards and Technology ($15,909), May 1995. Ebert, D., "Realistic Interactive Visualization for Computational Flows," UMBC DRIF award ($4500), May, 1994.
released at SIGGRAPH 98, ISBN 0-12-228730-4 ! Ebert, D. "Advanced Geometric Modeling," Chapter 12, CRC Computer Science and Engineering Handbook, 1996. 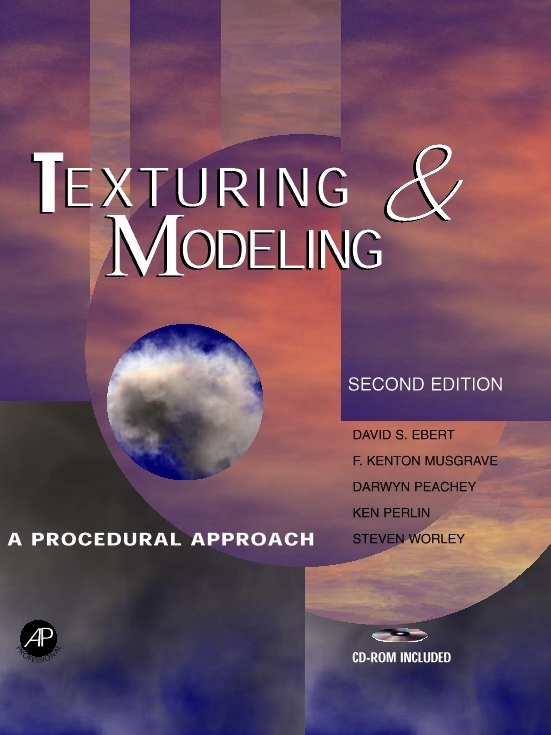 Talk and book signing for "Texturing and Modeling", Jan 11, 1997. You are visitor : since July 1, 1997.